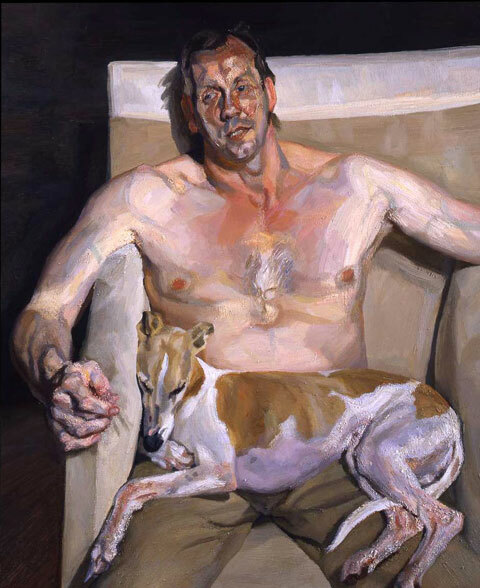 Painter Lucian Freud died at his home in London on Wednesday at the age of 88. The British artist spent his career focusing on the figure. He used paint in a dizzying way that followed/created movement of the flesh. His figures were anti-heroic and were placed within the frame of a canvas in a way that was both jarring and at the same time, aesthetically pleasing. Freud, grandson of psychoanalyst Sigmund Freud and the brother of the late television personality Sir Clement Freud, was born in Berlin in 1922. His Jewish family had to flee the city in 1933 and he become a British citizen in 1939. The realist painter was educated at the Central School of Art, London, the East Anglian School of Painting and Drawing in Dedham and Goldsmiths College in London. At a time in the 1950’s when Abstract painting was the fashionable mode of working, Lucian Freud continued to paint the figure and decided at that point to focus his career on portraits. His work followed in the tradition of classical portraiture, however the emotional resonance of the resulting images were anything but serene. While not as disjointed as the work of Francis Bacon, whom he admired greatly, Lucian Freud’s subjects emoted through his hand and application of paint on surface. They never smiled or appeared necessarily comfortable, yet the figures exist in space, sitting, standing or lying down in their own particular interior niche. While not necessarily always in fashion persay, Lucian Freud’s work most has set records at auction selling in May 2008, at Christie’s in New York for $33.6 million, the highest sale at the time for a (then) living artist.